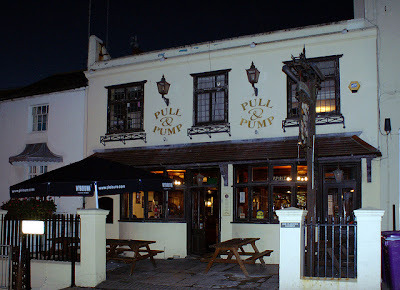 For once, I'm going to write something about a very nice and original pub in Brighton: The Pull and Pump. Besides a selection of ales, continental lagers and wines, this pub has the particularity of offering a wide variety of tequilas (more than 30 I think). The staff will be happy to help you if you don't know which one to choose. I will warn you about the "tequila of the house" which is quite cheap but also very strong. It's a trap! I was very surprised by the way they drink tequila there: they use to call that "sip sip". Indeed, they serve you a sort of sweet tomato juice to drink with the shot of tequila. I use to be an adept of tequila with salt and lemon, but I quite like this way as well. Located close to Churchill Square, it is not as crowded as certain other pubs, and sometimes it is nice not to spend the evening standing up (especially if you go clubbing after huh?!). Plus, I forgot to mention that the prices are totally reasonable.